Laws require that medical facilities keep X-rays on file for seven years. After that, it is important for hospitals, doctor and dental offices to dispose of X-rays properly. 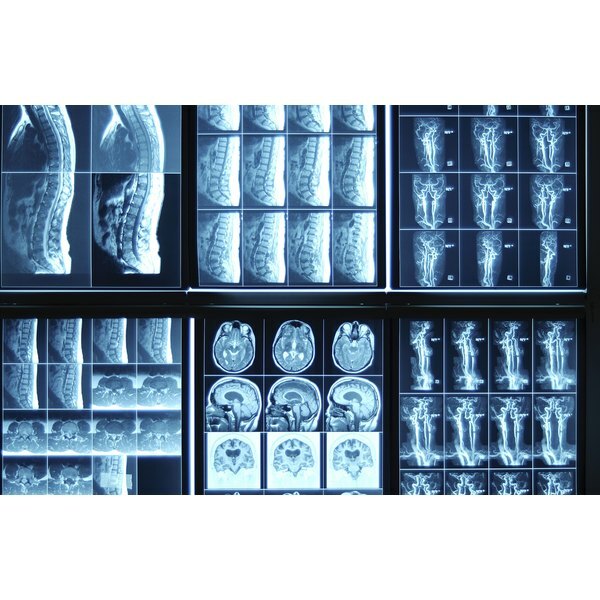 According to the Health Insurance Portability Accountability Act of 1996, it is illegal to simply throw X-rays in the trash due to privacy issues. Films must be destroyed. It is just as important for your own privacy that X-rays in your possession be disposed of properly. X-rays should be destroyed to protect not only your confidential health information, but the environment as well. Pick a recycling company that will provide you with a "certification of destruction" proving your film has been properly destroyed according to federal laws. Choose one that specializes in handling, recycling and disposing of X-ray film. Some companies will pick up your films for a fee; others have drop-off services. If you don’t have a local recycling company, several companies allow you to ship your film to their facilities; you pay for the shipping costs. Gather X-rays or film to be disposed and place into a sturdy box. Weigh the box to ensure it complies with postal regulations for shipping. Some recycling companies will also have weight limits for accepted materials. Enclose a letter in the box that contains all of your contact information as well as a request for a written certification that the X-rays have been destroyed correctly. Tape the box carefully to ensure it will not reopen during shipping and handling. Contact the recycling company to make the arrangements for shipping, pickup or dropoff. Inquire about any special forms or instructions for mailing before shipping your box. Request a return receipt or signature-confirmation service from the post office when mailing your boxes to ensure proof of delivery. Because X-ray films have silver, some companies will pay you for the silver recovered. Check with your chosen company to see how many pounds are needed to get payment for recovered silver. If a recycling company cannot be located, check for a professional document shredding company to destroy X-rays. Home and office shredders are not sturdy enough to destroy X-ray film. Check with schools to see if they would like to use X-rays for anatomy lessons. X-ray films have hazardous material that cannot be legally disposed of in landfills. Tisha Tolar is a freelance writer and co-owner of Trifecta Strategies, LLC, where she specializes in original articles, e-books, blog posts, Web content, and marketing copy. She has been an online writer since 2007 and has co-established several websites including ReliableWriters.com and MakeMoneyfromWriting.com. She is a graduate of the Art Institute of Philadelphia with a degree in specialized business technology.